Ik kan deze week niet 'gewoon' alleen maar de challenge posten. Daarom dit 'andere' begin dat m.i. meer zegt dan ik in eigen woorden kan. I can't put my challenge in the 'normal' way this week. That's why I started in this different way, that (I believe) says more then I can say in my own words. Tripoli is een tangle die ik nog nooit goed heb kunnen maken en ook vandaag lukte het niet erg. Maar 'het is wat het is' en ach de totale tile valt wel mee. Tripoli is a tangle that I don't master at all and today was no exeption. But .... 'it is what it is' and, well the total tile is not too bad I think. Thank you for your thoughts about the attacks in Paris. Such a shame the human race is still such a mess. However, you art is fabulous as always. Lovely thoughts, thanks for finding those words. Your tile is perfect and even a background tint of purple which used to be a semi mourning colour here. Beautiful words and a beautiful tile. Thank you. Wonderful words an work! Thank you! Met Tripoli heb ik een beetje hetzelfde als jij: het wil nooit zo lukken, maar uiteindelijk vind ik de tile wel OK ;-) De jouwe vind ik mooi geworden! Hij valt heeeeeel erg mee. Ik vind het een pracht tile geworden met al die andere goed passende patroontjes erbij. Thank you for sharing, Annemarie. We are all feeling a bit lost, I'm sure. Nice tangling. Thank you for the thoughts for Paris and our world. Your tile is a comfort tile. You used some of my favorite tangles. We are all needing comfort. Your poem is very warming and I echo your thoughts. As for the tile, somehow that quiet blue is exactly right. A beautiful poem, Annemarie. I agree though, it's hard to carry on..we must stop to think. If we focused on the pure and the simple, the world would be a much better place. Hope for healing. It is the right tile for the time. Tripoli can be a challenging tangle. I think Laura's advice to keep the space as consistent as possible helps as well as Cris's to not make it too small. This was a tangle that came out shortly after I began tangling so it has always been a part of my work. It does get a little wonky sometimes, but that is part of it's character. I think your tile looks great. 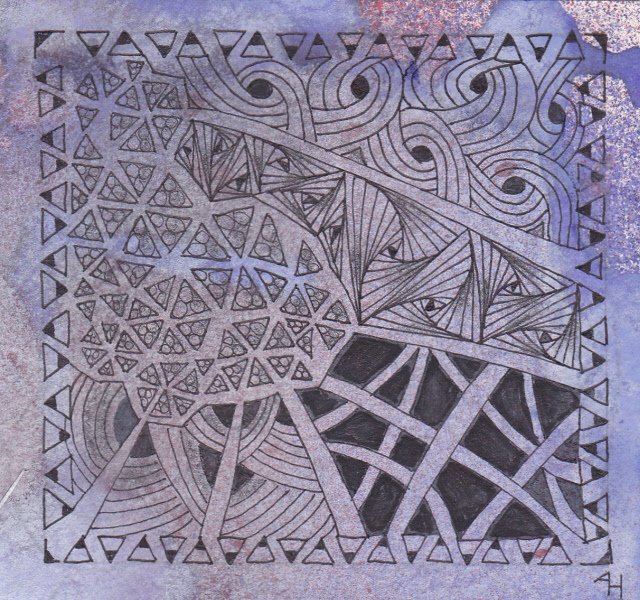 Wonderful thoughts expressed, I hope your beautiful Zentangle brought you peace. Thanks for sharing. I was very touched by the poem you shared. I feel fortunate to have zentangle and our ZT community, especially in these times where we need some peace and healing. Great post, dear Annemarie! Thank you for sharing that poem and thoughts. Your tile is beautiful! Especially I like your idea for the Tripoli border! Excellent thoughts Annemarie filled with great reminders. Thank you, and thanks for sharing your beautiful Tripoli tile. Annemarie, thank you for sharing this lovely poem!! Yes .... Your Tripoli is beautiful - I love the purple. I too have trouble with it! :) :) Peace! !